William Yarrow was the fourth of the six children of John Yarrow, and the second child with his second wife Elizabeth Jeffery of Little Thetford, Cambridgeshire, England. 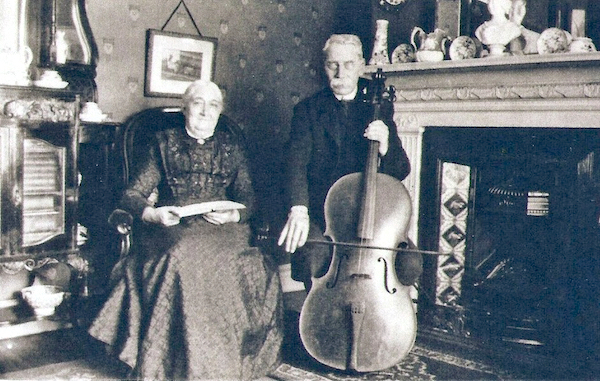 Above: William Yarrow playing cello alongside his wife Emma, at home in Liverpool. Photo: Andrew Martin. William married Emma Dennis of Soham, Cambridgeshire, and after living in Peterborough, Cambridgeshire, and later in Normanton and Altofts, Yorkshire, they eventually moved to Anfield, Merseyside. According to information that William and Emma give on the 1911 census, the couple had a total of six children, but only four survived. The family lived at 323 Walton Breck Road, Anfield for a number of years, between 1911 and until at least the late 1930s, when Emma died at home. William's affection of his family and his native Cambridgeshire is evident through the vast number of surviving letters sent back home to his nephew James Yarrow. He is by far the most and best documented Yarrow. His continuing and regular letters to his nieces have provided a wealth of information and also the moving accounts of the deteriorating health of his beloved wife Emma, and ultimately the helplessness he felt during her death. William was a keen Cello player, and he also sang for the Little Thetford Church, and was a Chorister in Ely Cathedral, and in Liverpool Cathedral Choirs. He was known for his fine Alto voice that complimented the voices of his brothers, becoming known as 'The Yarrow Quartet' through their performances at the Church and village functions. The song "Arise Shine" is noted as one of their most popular anthems. William took his voice to Liverpool Cathedral and performed in the choir for King at the Cathedral's consecration in 1924. He also provided a very useful clue into the Yarrow ancestry by means of his own handwritten family tree. When checked against my own research it proved to be all correct. William survived his wife Emma by three years, and his daughter Jessie by two. 3rd May 1849 at Little Thetford, Cambridgeshire, England. Emma Sarah Dennis (1848-1930) on 4th January 1872 at All Saint's Church, Normanton, West Yorkshire, England. 1851: 1yrs, The Wheat Sheaf Public House, Little Thetford, Cambridgeshire, England. 1861: 11yrs, Front Street, Little Thetford, Cambridgeshire, England. 1871: 21yrs, General Shop, Little Thetford, Cambridgeshire, England. 1881: 31yrs, Eastfield Road, Peterborough, Cambridgeshire, England. 1891: 41yrs, 27 Heyworth Street, Everton, Liverpool, Lancashire, England. 1891: 50yrs, 177 Breckfield Road, Everton, Liverpool, Lancashire, England. 1911: 61yrs, 177 Breckfield Road, Everton, Liverpool, Lancashire, England. 1935-1939: 323 Walton Breck Road, Anfield, Liverpool, Lancashire, England. On 3rd August 1941 at 52 Newton Road, Hoylake, Merseyside, England, aged 92 years. During 1941, location not yet known.